As Executive Director of Asheville on Bikes, Mike Sule regularly attends bike summits—i.e. meetings to discuss strategies for improving bicycle infrastructure and transportation policies. He’s also no stranger to lobbying, having attended the Bike Walk NC Lobby Day in Raleigh last year. But 2018 marked Mike’s first foray into summiting and lobbying at the national level. In March, he attended the National Bike Summit in Washington DC, where he met with fellow bicycle advocacy leaders from across the country and capped off the experience by meeting with our U.S. Senators’ and Congresspersons’ staff at a Federal Lobby Day. We asked Mike what it was like to talk shop on Capitol Hill. What is the National Bike Summit? The National Bike Summit, put on every year by the League of American Bicyclists, is one of the biggest U.S. conferences for bicycle advocacy. In addition to seminars and workshops, there are several “mobile workshops” which are field trips (via bike, of course) to tour thriving bicycle friendly businesses. There’s also a lobbying workshop to prepare for the Lobby Day part of the summit. Why did you decide to go to the National Bike Summit this year? I’ve been following the National Bike Summit from afar for over a decade. Having helped organize the NC Bike Summit for a few years, and attending BikeWalk NC Lobby Day in 2017, it seemed time to step it up to the national level. It was thrilling to finally be there in person. To talk face to face with advocates whose blogs I read or podcasts I listen to was incredible. 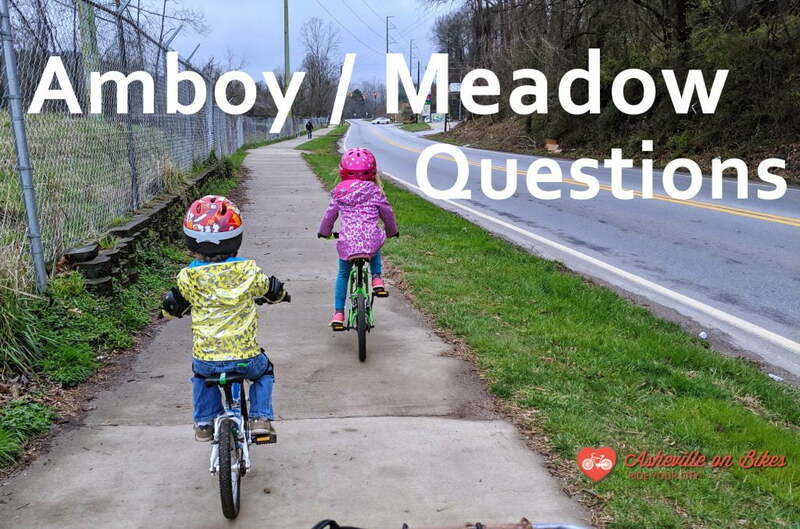 It was also a great way to see where AoB stands in regards to other bicycle advocacy groups, many of which have inspired our own work in Asheville. I learned that the majority of local organizations are entirely volunteer based, or maybe have a staff of one, just like Asheville on Bikes—even the largest group might have only 4 to 6 people on staff. It’s very reassuring to know that we’re in a good spot among our peers. What workshops did you attend? Two workshops were especially meaningful in terms of potential to help Asheville on Bikes and the cycling community in Asheville as a whole. An important goal of AoB is to be an inclusive and welcoming organization to all people. However, while we’re a diverse organization in terms of the ages, we’re well aware that we’re not very diverse in terms of ethnicity. This workshop was extremely beneficial in helping learn new ways to approach diversity, including how to identify our own implicit and unintentional biases in the organization, and how best to reach out to populations that are underrepresented in the AoB membership. Our after school program is one way we’ve made strides in the direction of becoming more diverse. Another idea that I think would do well in Asheville is to hold a series of Bicycle Rodeos—events where we set up simulated courses in different neighborhoods (for example, the Stephens-Lee Rec Center parking lot) to help people hone skills such as how to approach stoplights, turning, etc. One appeal of this idea is that it’s sustainable—once we set up courses, the infrastructure is there. To hold an event, all we would need are volunteers. At this workshop, we looked at states, such as Arkansas and Montana, who’ve done a really great job coordinating their efforts to package themselves as bicycle destinations and capitalize on the benefits of being a bicycle friendly community. Asheville is practically ready-made as a bicycle destination. We have some of the best roads to ride, most interesting and scenic areas to mountain bike, and calendar full of bicycle events geared to a variety of different types of riders, from our Bike of the Irish to high-profile, internationally advertised events like the Haute Route Stage Race. In addition, we have many bicycle-related industries, including Industry Nine wheel and hub manufacturer, Cane Creek Cycling Components, DeFeet who makes cycling apparel, and Fox Suspension, as well as industries that hold appeal for the cycling crowd, such as craft brewing. We’re doing pretty well on the tourism scene, yet we still have trouble connecting the dots and building a coalition between industry, recreational non-profits, and city and state government to most effectively promote western North Carolina as not only a great place to visit, but an attractive place to invest in because of the economic opportunities bicycling offers in the region. We need to come together and create a communication network and advocate as a significant economic engine in western North Carolina. Tell us about Lobby Day in Washington DC. What was that like? The lobby day was my favorite part of the whole experience. We got training on how to lobby effectively to representatives, and the next day we were released on the hill to go from one representative’s office to the other and make our case for why continued investment in active transportation at the federal level is important. It was so exciting to be there. The arena is so much more intense. You’re actually on the hill, walking by high-profile Senators’ offices. I met with staff of Senator Burr as well as Rep. McHenry, who represents Asheville and areas south and east, and Rep. Price, whose district is in the Durham area. It was great meeting with their staff and to have the opportunity to make our case face to face with those who represent us. What did you discuss with Congressional staff on Lobby Day? One main issue we lobbied for was to ensure TIGER (Transportation Investment Generating Economic Recovery) grants remain in place for federal transportation planning. Asheville has been a recipient of a TIGER grant, specifically for the current RADTIP project. In President Trump’s proposed transportation plan, TIGER grants are eliminated, but every staff member we spoke with gave the impression that the TIGER program is valued—that was uplifting. The staff were very receptive to my questions and listened to my concerns. 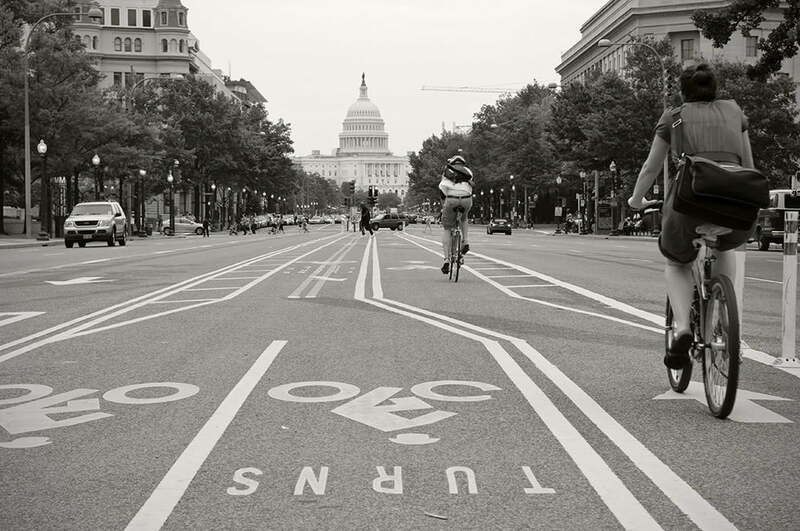 I was impressed with how much they knew about bicycle infrastructure, as it’s a daily part of their lives—DC has two bike-share programs, and protected bike lanes run right up Pennsylvania Avenue. Many staff use their bikes to get around. Looking back, what do you think is the main benefit of attending a national summit? Attending a bicycle advocacy summit is a great way to learn how transportation policy and funding works. It can be challenging as an advocacy director to communicate to the community just how complex transportation policy actually is. To stare into the back of the proverbial clock and see all of the cogs and the springs, all the mechanisms that make it work is extremely valuable in helping me communicate more effectively, and therefore advocate more effectively for transportation policy decisions that benefit all road users. You don’t have to go to Washington to help Mike’s lobbying efforts succeed and make Asheville a safer, more enjoyable place to ride a bike. Simply by becoming a member, you’ll be advocating for change. Join Asheville on Bikes now! Asheville on Bikes to Host Summer Cycle ‘18 on Saturday, June 23rd at New Belgium Brewing.